A groundbreaking research study of a ketone ester in an Alzheimer’s mouse model was released for publication January 4, 2012, in Neurobiology of Aging by Yoshira Kashiwaya, M.D. and others in the laboratory of Dr. Richard L. Veech at the NIH in Rockville, Maryland. This study showed that, compared to animals fed a normal control diet, the Alzheimer’s model mice who were fed the ketone ester (D-beta-hydroxybutyrate-(R)-1,3-butanediol) had significantly less amyloid and tau protein that form the plaques and tangles in the Alzheimer’s brain, and the animals showed reduced anxiety, and improved learning and memory compared to the mice fed the control diet. The Alzheimer brain in people becomes resistant to insulin beginning at least ten to twenty years before symptoms appear and this affects the ability of the brain cells to use glucose causing them to malfunction and die. It was discovered in the late 1960’s in the laboratory of George Cahill, M.D. (now deceased) that the brain easily switches over to using ketone bodies as an alternative fuel during starvation when glucose supplies are used up. 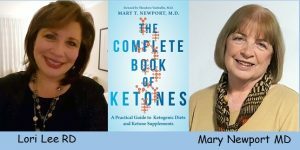 This new research is the culmination of decades of research that followed, and, for the first time, shows that ketones could lessen the changes that occur in the brain and also improve cognitive function in this disease. In addition to acting as an alternative fuel, ketones mimic some of the effects of insulin and are also anti-inflammatory. Inflammation is another key feature affecting the Alzheimer’s brain. Toxicity studies have already been conducted of the ketone ester in people showing there are no adverse effects and it has been approved by the FDA as “Generally Regarded as Safe (GRAS)”. Funding is now urgently needed to mass produce this ketone ester and conduct human clinical trials. A copy of the entire article may be obtained on my website at the top of the first page www.coconutketones.com.